At a time when lab tests guide more than 70% of medical decisions and personalized medicine opens new windows to wellness, Med Health Services (“MHS”) is making lab testing as accessible as possible. From early detection and diagnosis of disease to individualized treatment plans based on a person’s unique genetic makeup, clinical lab testing is key to improving healthcare quality and containing your long-term health costs. MHS provides patients in the Tri-State area with same-day, walk-in access to a comprehensive laboratory-testing menu at the most affordable pricing available. Our standard operating procedures place the patient’s needs at the core of our laboratory. We know that your doctor needs dependable results quickly to properly diagnose and treat medical conditions. As such, our on-site laboratory allows us to emphasize a rapid turn-around time that typically has results back in your referring doctor’s office that same day or the next morning. Our medical laboratory is open 6 days a week, 24-hours a day and is available to all patients on a walk-in basis, regardless of insurance. MHS has Walk-in Laboratory Draw Centers located within the Tri-State area that are designed, built, and operated around the needs of physicians, patients, and their families. These centers are strategically located to provide patients with convenient access to high quality laboratory testing services. Our staff is committed to providing a professional environment for each patient during the specimen collection process. MHS’ skilled staff works diligently to provide each client prompt and professional service. If you are bringing a minor to a Walk-In Laboratory Draw Center and you are not the legal guardian, you will need to bring a notarized statement signed by a parent or legal guardian authorizing you to give permission for the collection and billing of the tests ordered by the minor’s physician. To locate the Patient Walk-In Center closest to you click here. My doctor has ordered a lab test for me, and does not collect specimens in his/her office. How do I locate a draw center, where I can have my specimen collected? You can click here to locate a convenient Walk-In Laboratory Draw Center. No. Appointments are not necessary. In order to expedite your visit, please have available your insurance card, a copy of identification and a prescription or completed test requisition form from your healthcare provider. Do I need to fast before having my specimen collected at a Patient Service Center? 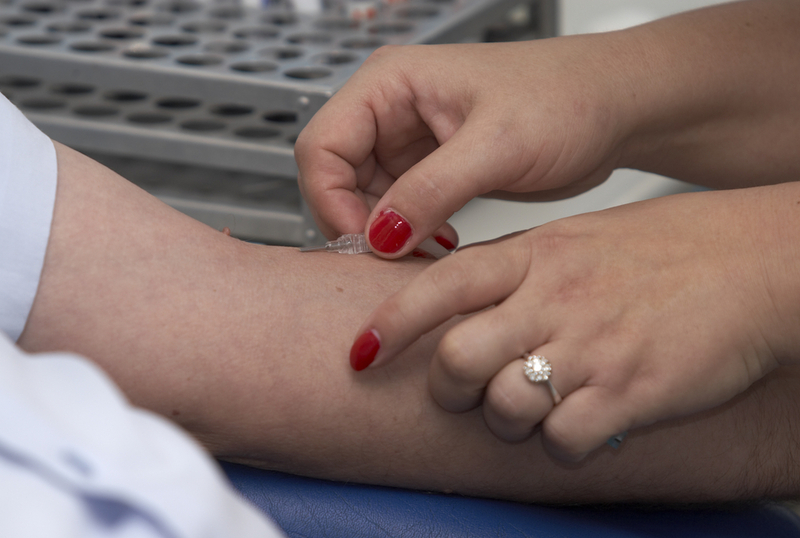 Some blood tests do require fasting prior to having your blood drawn. Please contact your healthcare provider to determine his/her requirements for your specific testing or call our laboratory at (800) 443-2035, extension 1 to inquire.